Do you sit at your desk thinking “I must post something on social media”, but find that your mind goes blank? Are you being told that you should be posting regular content on social media but don’t know what to post? The more pressure we put on ourselves, the harder it is. There is an answer to this – use social media scheduling tools to schedule your content ahead of time. It means that you can focus on creating a body of content in one go and send it out at regular intervals. “Evergreen” content – ie content that doesn’t go out of date. Most social media platforms now give greater reach to posts that get engagement. Live streaming works well for this, as do topical questions, quizzes, surveys, behind the scenes, and anything that gets an emotional response. However, most people would struggle to post this sort of content consistently. People need to see you across a number of platforms on a consistent basis. The more people see your name, the more they are likely to remember you, and eventually like and trust you. If you are sending out useful information, such as useful tips, that is even better, as it will make you memorable. It would be very hard to post at the optimal times on each platform without some sort of scheduling. Facebook, in fact, let you schedule posts up to a year ahead direct from the Facebook website. 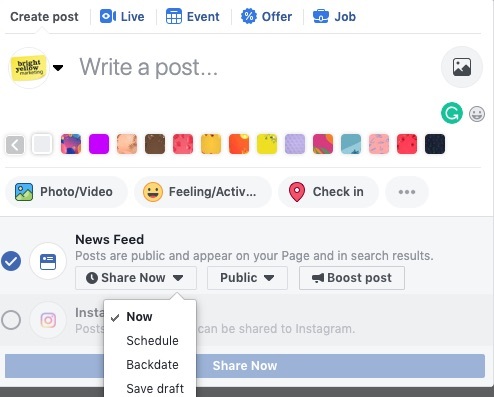 When you post to your Facebook page, instead of clicking the “Share Now” button, click the dropdown arrow and choose “Schedule”. You can then pick the date and time for your post to go out. By the way, in case you need to delete or amend your scheduled post, you will find it in the tab called “Publishing Tools” at the top of your page. If you can’t see this tab, click the “More” tab. There is nothing worse than the feeling of panic when you need to edit something urgently and can’t find it. All your scheduled posts are listed under the tab called Publishing tools. Twitter also has its own scheduling tool. Tweetdeck allows you to schedule a huge number of posts in advance, and manage your Twitter account all from one place. It means you can see everything from one dashboard, including messages, searches and lists, without having to click in various places on the Twitter website. Tweetdeck is free, and is an ideal tool if you only use Twitter. What other social media scheduling tools can you use? Basic schedulers, such as Buffer. Schedule and manage all your social media accounts from one interface (eg Hootsuite, Agorapulse, SproutSocial. If you have team members, they can usually create posts in advance and send them to you for approval. By the way, the tools that allow you to send out recurring posts usually talk about “queues”. Basically, you create timeslots for your content to go out, and you queue your posts to go out one after the other so that each post goes out in the next available timeslot. There are a huge number of tools available and I have a pdf comparison chart if you want a full comparison. Facebook and Twitter – recurring posts. Postplanner will send out recurring content to both platforms and will also show you popular posts that you can share on your own social media. You open a Postplanner account via your personal Facebook login, so if a team member does this and then leaves, you are left with no access to the account. This is particularly annoying if you have the paid Postplanner account. It also only gives you one “queue” for each platform. Mulitple Platforms – basic scheduling. The free version of Buffer allows you to schedule 10 posts at a time. The paid version is £10 per month for 100 posts, and this also allows you to schedule to Pinterest. Multiple Platforms – management and scheduling. Hootsuite is a firm favourite here. Hootsuite allows you to post to most of the main platforms, and to schedule re-tweets, so that you are not sending out a flurry of re-tweets in one go. It also lets you run Twitter searches based on location. The free account offers you 3 social channels and 30 scheduled posts. Their pricing has gone up this year so paid accounts start from about $29 a month (the pricing seems to change occasionally). Multiple Platforms – recurring posts. Socialoomph, Agorapulse, SproutSocial, Sendible. Sendible is the cheapest option for these tools, at £25 per month, but does not have as much functionality as some of the others. Sendible is perfect for anyone who is starting out and needs a cost-effective platform to schedule recurring posts – and it’s the only platform I have come across so far which allows you to schedule posts to Google My Business. Agorapulse and SproutSocial offer more flexibility in terms of queues, analytics, timing of posts and monitoring messages. Agorapulse starts from £39 per month for 3 social profiles, Sprout Social is the most expensive tool, starting from $99 per month. Socialoomph is free for one platform and then costs from $15 per month. Socialoomph used to be my favourite tool but they have now limited the number of platforms/ queues for new users. Instagram Most of the main social media scheduling tools mentioned above now offer Instagram scheduling, but not many of them currently offer the ability to schedule Instagram Stories. Onlypult is a useful tool for this, and it also saves relevant hashtags for you. Planoly is good if you want to see what your profile looks like with the scheduled posts. Planoly is free unless you post video or reach your posting limit. Iconosquare has become one of the main Instagram tools and has fantastic analytics. Instagram and Pinterest. Tailwind is a fantastic tool if your focus is on Pinterest and Instagram, with bulk uploading, great analytics and many other features. The price starts from $9.99 per month per account so it is slightly more expensive than some of the other tools just for these platforms, but it does offer extra features. It doesn’t currently schedule to any other platforms, so is a bit of a specialist tool. There are many other tools out there, but these are the main ones that I have used. They do change all the time, so it’s always best to check the features and pricing of any tools that you are considering using. Most of them give you a free trial. Sara Greenfield of Bright Yellow Marketing, our Guest Writer this month. We hope this is helpful information – please let us know your experience with any of these social media scheduling tools in the comments below.